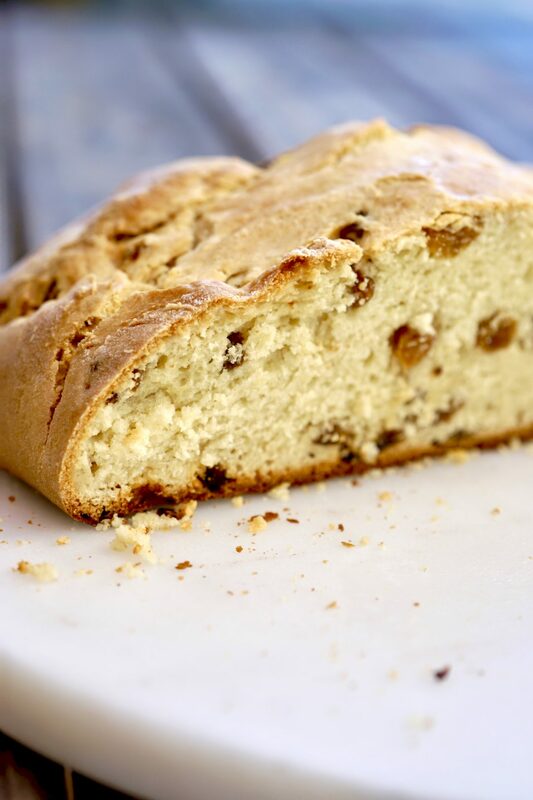 Irish soda bread is one of the most well-known and popular quick breads there are. Soda bread is a soft textured, cake-like bread that rises due to the reaction of the acid (buttermilk), and the base (baking soda). Although this simple classic is most often attributed to Ireland, they were not its creators. American Indians were actually the first people to use soda to leaven their bread. American Indians used pearl ash (a natural form if baking soda) to help leaven their breads without the presence of yeast. The Irish replicated this technique and became famous for it. 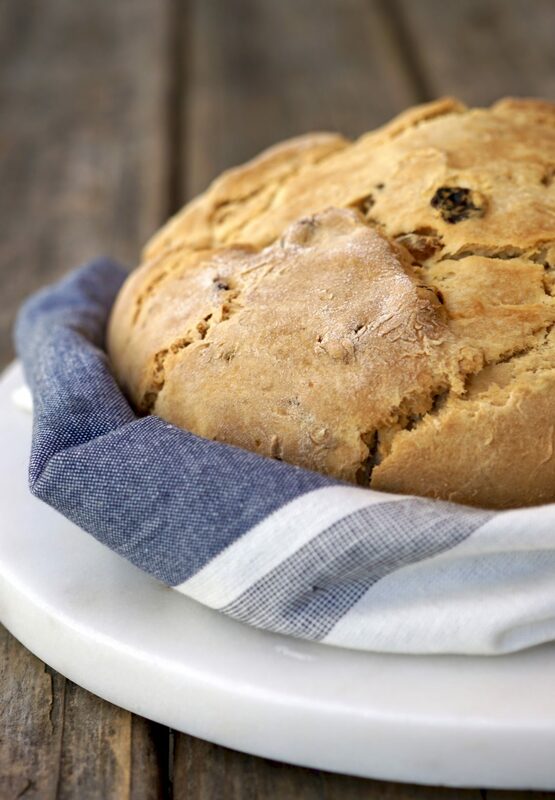 Irish soda bread, as we know it, can be traced to the late 1830’s, and was developed out of necessity. Due to Ireland’s financial struggles, only simple and inexpensive ingredients were available, this included soft wheat flour, baking soda, salt, and soured milk. Ireland’s climate was ideal for growing wheat of the soft variety, which grew in abundance. 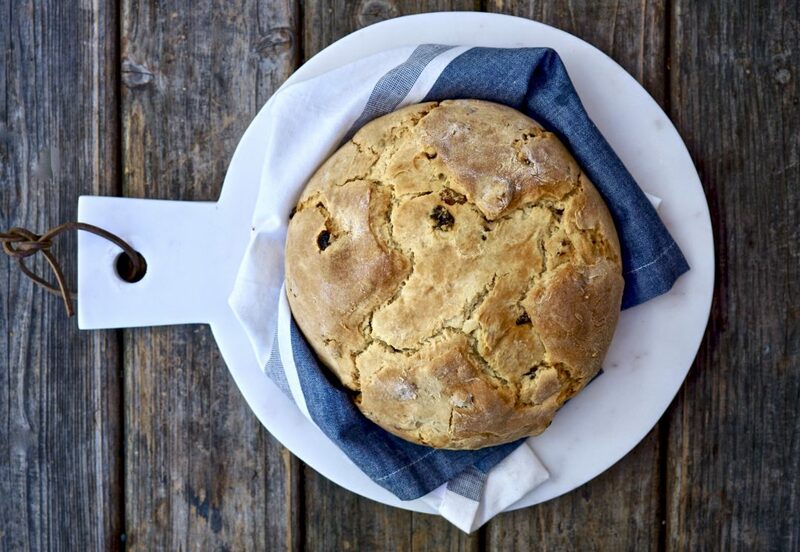 As result, soda bread became a perfect match for many Irish households. As I touched on above, the unique texture of soda bread is the result of a chemical reaction taking place between acid and baking soda which forms small bubbles of carbon dioxide within the dough. In modern recipes, sour milk eventually got replaced with buttermilk. 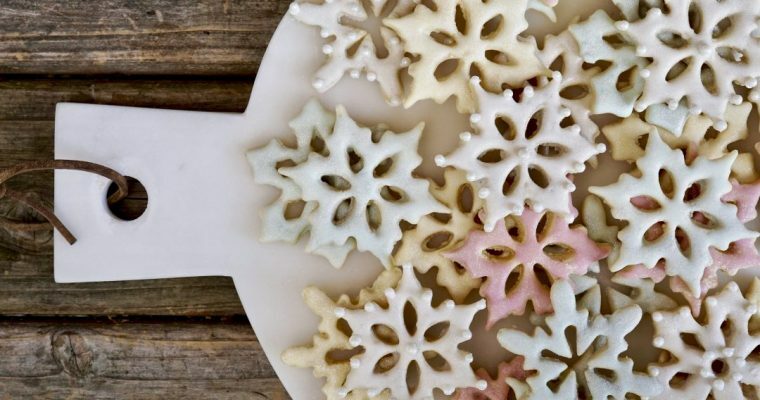 Traditional soda bread recipes call for you to mark the top with a cross, this was done to help ward off evil and protect the household. 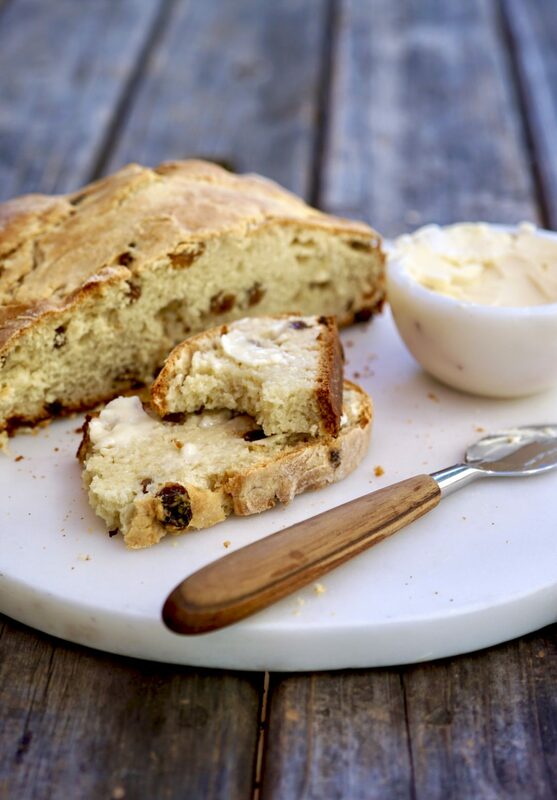 This recipe is lightly adapted from Ina Garten’s traditional Irish Soda bread recipe, a favorite of mine. I stray from the traditional addition of currents, opting for juicy golden raisins in their place. 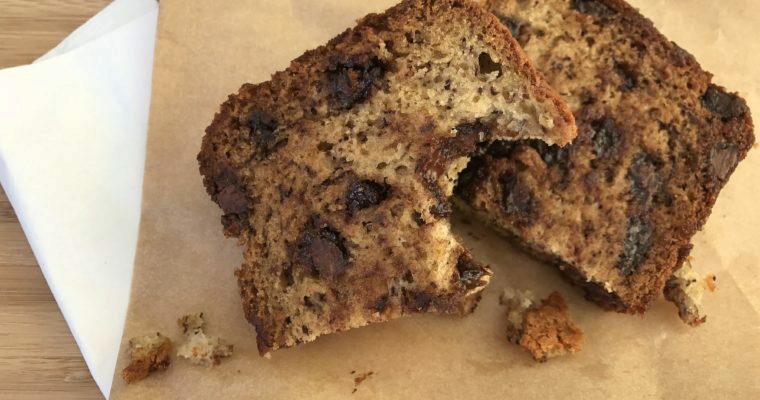 Soda bread is an important part of Irish culinary history and a go-to for St. Patrick’s Day celebrations, but it is not why I’m blogging about it. A close friend of mine in New York (who’s happens to be Irish) makes this bread every year in celebration. 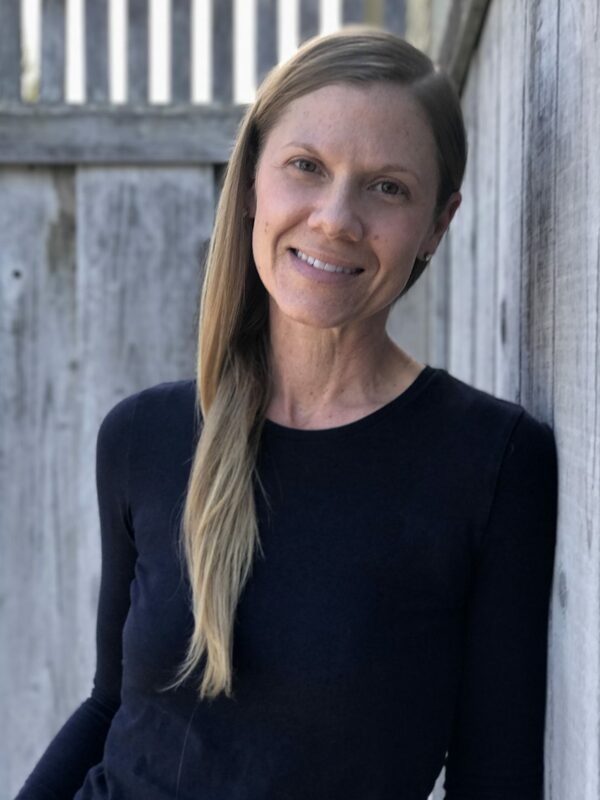 Once made it with her mom and siblings, she now makes it with her two young girls. I have long admired her and the lovely Irish family traditions she has held onto and carried on. So, I made this bread in her honor, and for the small part of me who’s also Irish. Kate, I hope you like it! Step 1 Preheat the oven to 375 degrees F. Line a baking sheet with parchment paper and set aside. Step 2 In the bowl of a mixer, such as a KitchenAid fitted with a paddle attachment, add the flour, sugar, baking powder, baking soda, and salt. Mix on low until well incorporated. Step 3 Add the butter and mix. Add the egg. With the mixer on low, slowly add the buttermilk and mix until incorporated. Add the raisins. Note, the dough will be wet. Step 4 Place the dough on a well floured surface and knead a few times adding additional flour as needed to prevent sticking. Form the dough into a round ball and place on the prepared baking sheet. If desired, lightly cut an “X” into the top of the bread with a serrated knife. Place in the oven and make for about 45-50 minutes or until firm and hollow when you tap on it. Step 5 Allow the soda bread to cool on a white rack before slicing. Serve warm with butter.